Insomnia is a major problem in America. Experts suggest that as many as 60 or 70 million people struggle with sleep disorders. Shockingly that number could likely be much higher simple because many people just never bother to see a doctor—they think regularly losing sleep is just a nuisance, and not an indication of anything more medially astounding…. Jetlag throws the body’s biological clock off. Oddball travel schedules can have you up and jetting across the country in the middle of the night. Different cultures and foreign environments can have a very significant effect on your sleep patterns. All of the above can make your travel and vacation a bit LESS relaxing. The travel pillow market encompasses a dizzying array of pillows all designed to make you more comfortable when sleeping or sitting. Think those seats on the airplane are uncomfortable? 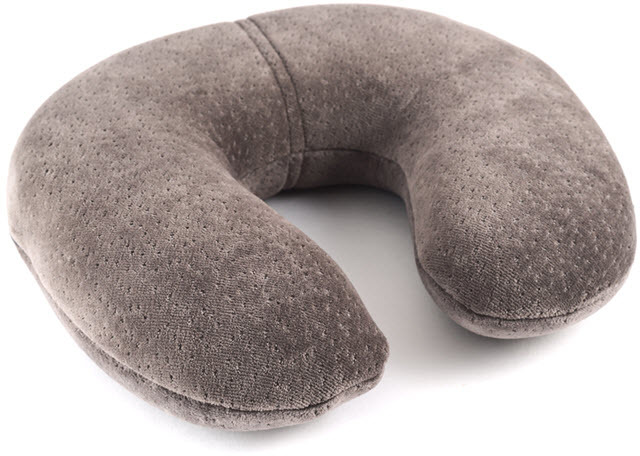 Travel pillows are made from molded foam, natural and synthetic fibers, loose beads, beans and natural husks, may include aromatherapy, washable covers made from hypoallergenic cotton, velour, satin, silk, and faux fur. In response to the physical demands of travel the sleep industry has answered with some high-end, high-comfort portable pillows many of them in shapes that support your neck, while reclining or seated. The Tempur-pedic travel pillow is made of the same materials as are the infamous mattresses of the same brand-name. The material is soft, pliable and molds to the exact shape of your body--in this case your head and back of your neck, providing you with ultimate orthopedic support. These are the pillows that travel into space with NASA astronauts and engineered to provide support during G-Force travel. Combine the sleep cycle disruptions of travel with neck and back pain and you have a big recipe for insomnia and a bad experience away from home. If you’re traveling for work you suffer if you’re not at the top of your game and if you’re on vacation you end up having a poor experience. Weigh the low-cost of a travel pillow against the other costly expenses associated with your travel next time you pack for a trip.